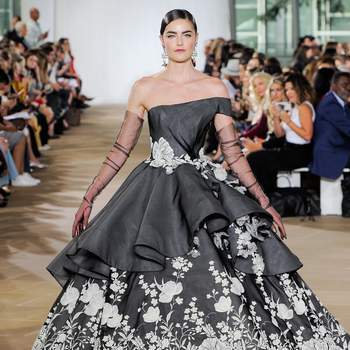 One of the most highly-anticipated showcases at New York Bridal Fashion Week for us here at Zankyou was that of Argentinian designer Ines Di Santo. Having been thoroughly astounded at the beauty of the Spring/Summer 2019 Collection, we couldn’t wait to see what this veteran designer had in store for us for next Winter – and what we were given certainly did not disappoint. Inspired by the magic of the folk tales and fantastical legends of our childhoods, the new Ines Di Santo range will take your breath away. We have to immediately comment on the three absolute-standout pieces from the East of the Sun and West of the Moon Collection (with a name that beautiful, we’re certainly not surprised at its content!). Incorporating colour into bridal collections is a path that few designers dare to tread, and even fewer do so with success; Ines Di Santo does it with an unequalled mastery. Pushing pastel palettes aside, in the Journee, Ebullent and Elora gowns, this fabulous designer uses bold colours and stunning floral embroidery and embellishments – which make one feel as if they are themselves traversing an enchanted forest, or stepping into the pages of a fairytale. Romantic, ethereal and 100% sure to make a statement, there could be no better dress for the modern bride. And beyond just these three pieces, there is a whole world of wonder awaiting your perusal. With couture cuts, sophistication, and a touch of design innovation that reminds us just how attuned Ines Di Santo is to the latest trends, the East of the Sun and West of the Moon Collection is dramatic, bold and very beautiful. Toying with lace and sheer panelling, there is a element of sensuality in some of the gowns – particularly NYX – but more than anything else, these dresses are made for the softest of brides and the sweetest of temperaments. 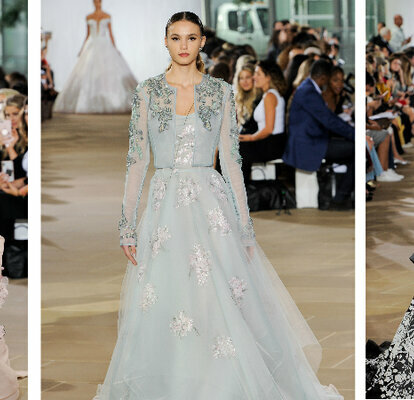 Dulce, Melia and Dove are the best examples of this within the catwalk show – with delicate fabrics, voluminous skirts and glittering embellishments, there could be no better choice for your 2019 wedding. One of the best collections we've seen, bursting with originality for fashion-forward brides. The 2019 Zuhair Murad Wedding Dress Collection will captivate you at first sight.